Winner Small Hotel of the Year at the Northwest of England Tourism Awards 2010! Elegant 18th century country house hotel, peacefully situated in 18 acres of grounds. A host of walks beckons from the front steps, or a short drive will take you to the popular centres of Lakeland. Adrian's award-winning four course dinners are a delight, and you'll feel at home right away with our relaxed, friendly service. Try one of our Superior Rooms for that special occasion. Your well behaved dog is genuinely welcome to stay too! 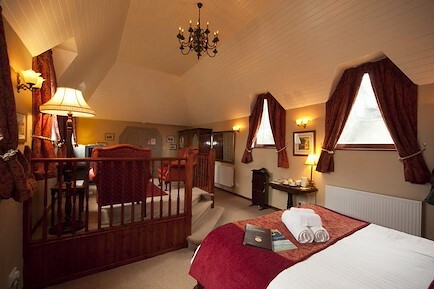 We have 11 double rooms, all en suite with large double-ended baths and separate shower units: 7 spacious Superior rooms, including one with a king size four poster bed, 3 smaller Junior rooms and the Garden Room, our only ground floor room with whirlpool spa bath and access to the garden via a private balcony. Three of our Superior rooms and the Garden Room can be twin or double-bedded rooms, and three rooms are large enough to accommodate an extra bed for families. From M6, take junction 40, Penrith. Follow A66 to Keswick. Do not drive into Keswick town centre. At roundabout outside Keswick, take 3rd exit, A591 to Carlisle. After 7 miles, turn right at Castle Inn hotel, towards Ireby. You are now travelling along a minor road. After two miles, turn right at sign embedded in wall. Hotel entrance is 400 yards ahead on right. Your enquiry will be sent directly to Overwater Hall Hotel. Please fill in as much detail as you can.